Large scale weather systems have no boundaries. 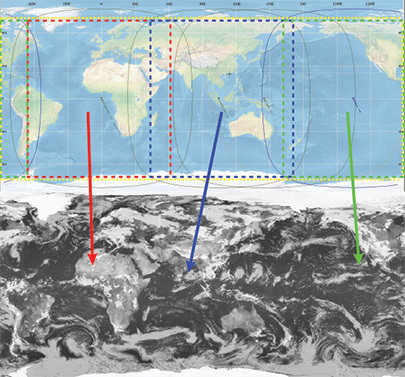 Automatically integrate multiple geostationary satellite images to create a global composite. Geostationary satellite data is available from a number of sources on the internet and via direct broadcast groundstations. But, the data is in different formats and different resolutions, and access requirements vary widely from one supplier to another. Our Global Mosaic software automatically ingests data from these various locations and re-formats them to a common format. The images are seamlessly joined to produce an integrated, composite image. Different resolutions and color shadings are adjusted to create a single, consistent image. The image is updated automatically, producing an animated, constantly changing view of the weather systems on the entire earth.